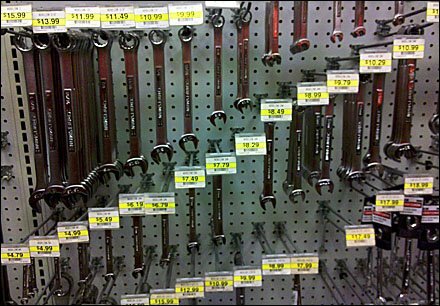 Only possible on Pegboard, an interesting visual layout that actually presents the wrenches stepped size- and price-wise. A quick easy improvement would be through use of Straight Entry Hooks. These would allow changes within the crowded sizing display without requiring adjustment of more than the hook in question. SEARCH “Hook Patterns” or “Straight Entry” to see other examples. And since this illustrates an advantage of Pegboard, maybe it deserves cross reference with the “Best Practices” TAG. The most beneficial style of Straight Entry Hook for your specific need is difficult to divine sight unseen. You should research the various one- and two-piece designs.